After yet another championship season, people continue to wonder just when the Spurs will slow down. With much of the same core as last season in place, though, it probably won’t be this year. San Antonio will be right in the thick of things in the playoff race again, as they wait for someone to dethrone them. The general consensus came to the same point that the Larry O’Brien trophy confirmed: the Spurs were the best team in basketball last season. Other than another year on the bodies of their big three (which hasn’t hurt them before), there’s no evidence yet that that has changed. If it ain’t broke, don’t fix it. The Spurs didn’t add or lose any likely rotation players this offseason, so team chemistry should be at a high, as coach Gregg Popovich will be able to use with ease all of his schemes and systems that won San Antonio the title last season. The Spurs clearly have far and away the best “first eight” in the NBA. With 6 players in the top 100, far better than any team in the West or East, and talent at every position, it’s hard to gameplan against San Antonio. This kind of depth gives them the ability to really exploit a mismatch at any position. Though Duncan, Ginobili, and Parker are likely to regress this year, it won’t be far, and improvements for younger players like Patty Mills and especially Finals MVP Kawhi Leonard (who both had coming out parties to the public in the playoffs, but according to the rankings, were excellent all season long) should keep the Spurs just as deadly. 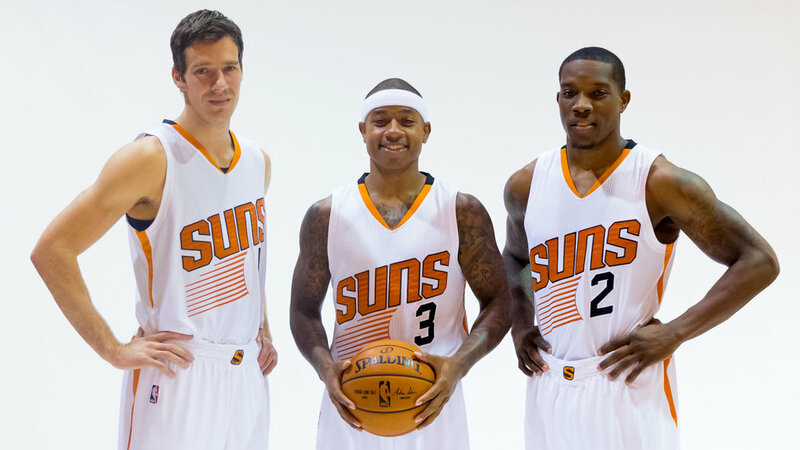 It may be like a broken record, but when will this big three stop finding success? If the rest of the Spurs continue to hold water, allowing Gregg Popovich to keep the big three’s minutes down as he did last season (none of the three averaged more than 30 minutes per game), San Antonio should be fine. How will Kawhi Leonard build on his impressive campaign from last season? Kawhi, still just 23, has the right situation to become the next Spurs legend, and the remaining improvement for Leonard before the old guys retire will be important. He’s clearly a great ball-stopping defender, but can he become a go-to option offensively? Just like any other team, the Spurs must stay healthy to succeed, but with one of the higher age per minute numbers in the league, San Antonio is more vulnerable than most. This really flows in with the first bullet, as low minutes will further help the health of this team. 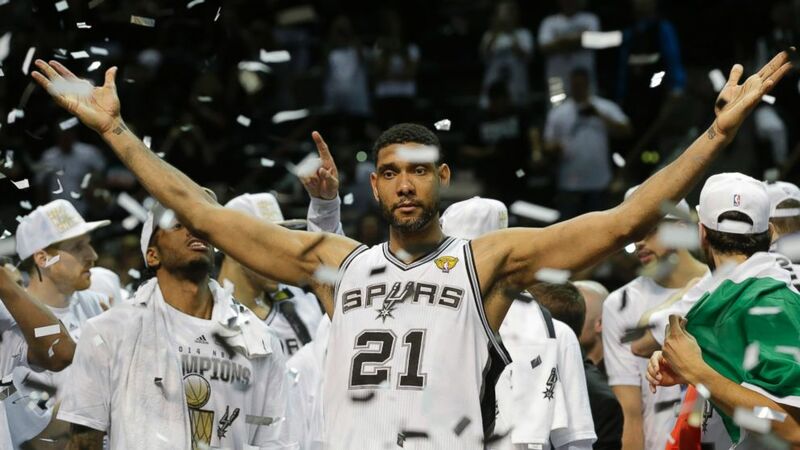 With such a veteran champion presence, it’s hard to see the Spurs falling victim to a title hangover. Although they don’t necessarily have one superstar anymore (which hurts their media coverage), they don’t need one, as unmatchable depth and consistency across the roster, alongside excellent leadership and coaching, should see the Spurs atop the West once again, and competing for yet another championship. The Clippers have been great in the regular season the past few years, but continue to fall just short in the playoffs. 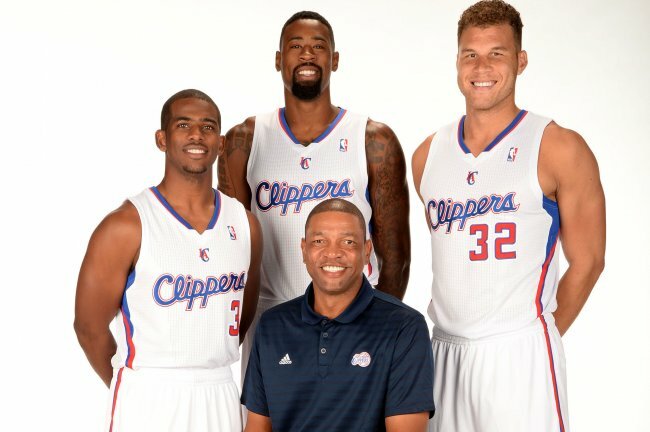 With much of the same core as last year, the Clippers will have just as good a shot this season as last, and with the Donald Sterling debacle finally out of the way, it’s time for this team to focus on their goal of the first championship in franchise history. Although they fell to Oklahoma City in the playoffs, all metrics but the tournament and the standings themselves liked Los Angeles as the better team, and perhaps the best in all the Association. Now, the Clippers must show they’re consistent, and play just as well or better for another season to stay in the thick of things at the pinnacle of the uber-competitive West. It was one step forward; one step back for the Clippers this offseason. Losing one of the more underrated point guards in the league in Darren Collison won’t do them wonders, but Doc Rivers and the front office believe that the second unit can run successfully enough through Jamal Crawford and new backup point Jordan Farmar. The addition of Spencer Hawes addresses what was a big need for LA in the frontcourt, and his ability to spread the floor will help the rich (1st in points scored; 3rd in field goal percentage last season) get richer offensively. In all, their break looks like a bit of a wash, which, all else equal, shouldn’t really hurt the Clippers’ prospects. The Clippers benefit from being the only team with three top ten-caliber players on their roster, the big three of Paul, Griffin, and DeAndre Jordan. Most people agree Chris Paul is the league’s best at the point, while Blake is a top-flight four (probably battling with Kevin Love and Anthony Davis for the title of best), but not many people know the impact of DeAndre Jordan and how elite a center he really is. His WAR numbers make it clear, but if you’re still not convinced, remember that Jordan averaged a ridiculous 10.4 points/13.6 rebounds/2.5 blocks last season on 68% field goal shooting. Just to be sure, why don’t you go ahead and read that stat line again. Spencer Hawes and Glen Davis will bring solid depth for the front line, but suddenly spots 1-3 look thin for the Clippers, with the loss of Darren Collison and JJ Redick’s propensity for injury. As Jamal Crawford continues to age, his defense continues to suffer, and he’s already one of the worst stoppers in the league at his position. Doc Rivers’ squad is a bit more top heavy this year, but his coaching abilities and the strength of his best few players should keep the Clippers humming along. How high is Blake’s ceiling? He saw great improvement last season, and at just 25 years old, it’s safe to assume he is still just entering his prime. Further improvement from the already top ten talent would be welcome news for Los Angeles. Is this the year Chris Paul begins to lose a step? He’ll be 30 by the end of the season, which is far from old, but for a point guard who thrives on quickness, is on the cusp. Of course, even an unforeseeably large regression from Paul would likely still put him as one of the best players in the league and at his position, so the concern isn’t huge, but the Clippers will likely keep an eye on Paul in an effort to keep him at full health for the playoffs. What will Los Angeles get out of their supporting cast? This is likely their biggest question this season, and could be the difference between them coming out of the West or facing another early playoff disappointment. With their two most notable role players, Jamal Crawford and Matt Barnes, both 34, longevity will be an issue worth keeping a tab on. The Clippers have some questions, but it’s hard to argue against the league’s best big three (sorry, Cleveland) being deployed for one of the league’s best coaches. With Kevin Durant’s early injury giving them a head start, Los Angeles should be good enough for second in the West, and probably the league, barring disaster. The Thunder fell short of the Finals again last season, and with Kevin Durant fresh out of the surgery room, there is cause for concern in OKC. But will this be the year Russell Westbrook finally quiets his haters for good? Most rankings agreed that the Thunder were the West’s third best team last season, other than the two that mattered most: standings and playoff longevity. A series win over Los Angeles showed that OKC is still there with the class of the West. The Thunder kept their core together this year, and let their starting shooting guard go in the hopes that either Jeremy Lamb or Andre Roberson begins to pan out this season. Anthony Morrow was a good depth add at the two, while rookie Mitch McGary is unlikely to see much time with the two top slots filled at both power forward and center. Thabo’s defense will be missed, but his absence is unlikely to have a significant effect on the Thunder’s prospects this season. A look at the WAR rankings shows one of the many reasons so many people believe Scott Brooks is hurting the Thunder with his coaching. Kendrick Perkins is not just the worst starting center in the NBA, but one of the worst players in the entire league, ranking in the 400s in all three metrics. Nick Collison, on the other hand, is a statistical enigma, ranging from top 50 to near Perkins across the three rankings, but clearly a better contributor on the court than the man starting in his place. As a matter of fact, Collison ranks 7th in the NBA in ESPN’s RPM, which is a per-minute version of their WAR metric. It’s more than apparent that the Thunder are a better team with Collison on the court and Perkins in his jumpsuit. Russell Westbrook’s injury hurt his rankings last season, but looks primed to bounce back in a big way this year, as he’s healthy and will have full control of the offense until KD comes back. 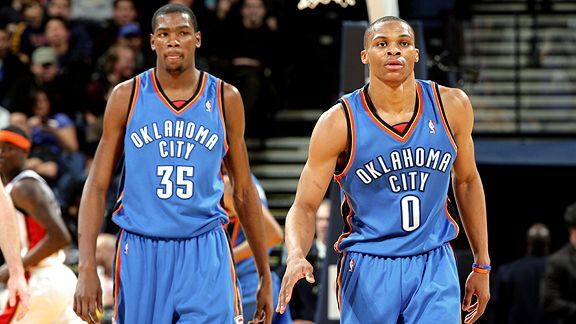 How will the Thunder hold up until Kevin Durant gets back? A lot of that will fall on Russell Westbrook, who hasn’t played much without Durant in the lineup over the course of his career in OKC. Westbrook is likely a top three point guard when healthy, and he’ll have ample chances to prove it in the early going. Who will start at the two and five? The Thunder have a competition at shooting guard between young guns, while less of a competition at center where there should be one. 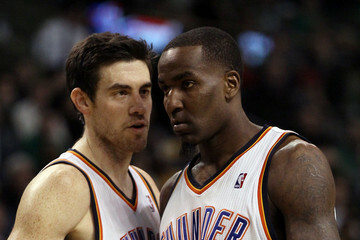 If these two cogs aren’t resolved correctly, the Thunder will fall short of a championship once again. How will Reggie Jackson and Steven Adams build on their promising seasons? Jackson was a candidate for Sixth Man of the Year last season, and still has room before hitting his ceiling. Could he possibly see time at starting shooting guard? If so, backup point duties would fall to Sebastian Telfair, a less than promising prospect for OKC. Steven Adams is the bitter shadow of the James Harden trade, but has potential with a big body and ample toughness. Perhaps he can be the man to crack the Thunder’s starting five in place of Kendrick Perkins. With less-than impressive depth and early health concerns, it’s hard to predict a title for the Thunder as of now, but assuming Durant is healthy enough in a couple of months, the combination of him, Westbrook, and Ibaka should be plenty to put OKC at home in a first round playoff series. Despite one of the league’s best point guards and an excellent supporting cast, the Warriors haven’t been able to crack the West’s elite the past couple of years. Is this season their chance to make a move? It looks like the Warriors simply got unlucky last season – both metrics believe they were the 5th best team in the league, but ended up with the 6th seed in their conference. Being in the West was a struggle last season, and Golden State likely would’ve had a shot at the top seed had they been in the East. A first-round matchup against the Clippers compounded with the loss of Andrew Bogut wasn’t too lucky either, but many forget that the Warriors took that series to seven. A fresh start will mean good things for this team. The Warriors didn’t shake up too much this offseason in terms of on-court personnel, but they did upgrade their backup point with Shaun Livingston, a guy who probably deserved to start over Deron Williams in Brooklyn for much of last season. Livingston isn’t much of a shooter, but his size (6′ 7″) allows him to post up smaller guards and have an impact defensively. He’s definitely a different type of primary ball handler than Golden State’s been used to (Stephen Curry, Crawford, and now-Trail Blazer Steve Blake are all excellent shooters not known for defense), so it will be interesting to see how he flows with the offense. The bigger move for the Warriors this offseason was the addition of new coach Steve Kerr, who will likely be a perfect mentor for fellow sharpshooters Curry and Klay Thompson. Last season under Mark Jackson, Golden State didn’t have much of an offensive system, but Kerr is well versed in the scoring side of the ball, so this looks like an ideal marriage. 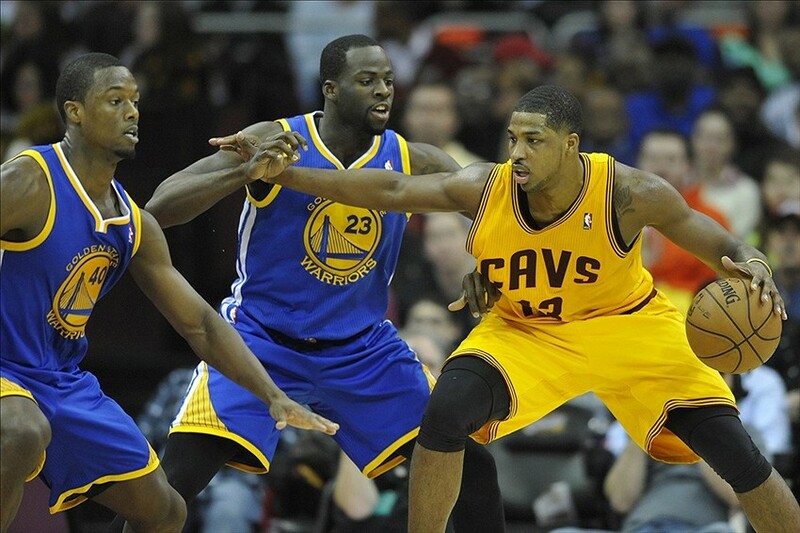 However, the Warriors were an excellent defensive team under Jackson – will that change as well? The Warriors have an extremely impressive lineup, with depth rivaling that of the Spurs: 6 players in the top 80, including their top 10 superstar in point guard Steph Curry. Although Curry and Lee are weak defenders, their complements on the wing (Thompson and Iguodala) and on the block (Bogut) are more than enough to make this team a demon defensively, especially when coach Steve Kerr has the ability to switch Thompson or Iguodala onto the opponent’s point guard. The most notable player is Draymond Green, by far the Warriors’ most important X-factor, whom all three metrics agree is a more than competent forward, especially defensively. Green ranks 12th in ESPN’s DRPM and 5th in Basketball Reference’s Defensive Rating. His versatility (able to play both the three and the four) coupled with a slowly improving offensive game, make him one of the league’s most underrated young players. The flip side of the coin is 2012 draft mate Harrison Barnes, who went 7th where Green fell to 35th. Barnes had a tough season last year, and the metrics reflect it. Without showing strides on defense and continuing to struggle with his shot (.347 3PT last season), it seems the sooner Steve Kerr realizes most of the forward bench minutes should go to Green, the better. Health: Can Stephen Curry and Andrew Bogut stay on the court? Both have been notoriously injury prone, but Golden State will probably need both at full strength if they want to make a deep playoff run. Can Klay Thompson take the next step? His defense and shooting make him an excellent complementary player, but many people believe he has the potential to become a top 5 shooting guard. If he can improve his handling and playmaking, the Warriors’ perimeter will be even scarier. How successful will rookie coach Steve Kerr be? Mark Jackson was known as a motivator, while Kerr is more of an Xs and Os guy. How welcome of a change this is to Golden State’s players will affect how far they can go. With a true superstar in Stephen Curry, rising young talent in Klay Thompson and Draymond Green, and complementary players across the lineup that will affect both sides of the floor, Golden State looks primed to take the jump and surprise a lot of people this season. After an encouraging first year of the James Harden/Dwight Howard duo, the Rockets had a disappointing first round loss at the hands of the Trail Blazers, followed by an offseason of lost contributors and controversy regarding team chemistry. After the offseason’s turmoil, the Rockets have become a forgotten cog in the strong Western Conference playoff picture. Can they silence their haters this season? Houston, by most accounts, was a top five team in the NBA last season, riding a big paint protector and an explosive analytics-fueled offense – shoot threes, get to the rim, get to the stripe; avoid the mid-range. They’ll ride the same beneficial philosophy into battle this year. Houston’s big move was letting Chandler Parsons go to the Mavericks, while replacing him with former Wizard Trevor Ariza. As the season goes on, this will be a much-scrutinized move, as many people wonder whether Rockets GM Daryl Morey made the right decision. While Ariza can’t initiate offense or run the break the same way Parsons can, he’s an upgrade on defense and on the perimeter. This move could go either way, though, as Parsons still has room to grow, while Ariza is an aging wingman carrying some “contract year player” baggage. While the addition of Ariza should help Houston’s defense, the loss of Jeremy Lin will likely hurt their offense, as he provided a go-to scorer off the bench who could command full control of the offense. Without Lin, the Rockets will turn to unheralded and unproven young guard Isaiah Canaan at the backup point. Houston also made a big push for Heat big man Chris Bosh, who would have been an excellent fit next to Dwight Howard, but missed out. Had Bosh signed, the Rockets could have found themselves one of the top two or three teams in the West. The Rockets have an excellent group of starters, with an elite scorer (Harden), three elite defenders for their position (Beverley, Ariza, and Howard), and four guys that can spread the floor past the arc (all but Howard). The Rockets’ progressive offensive philosophies will help them to be one of the league’s top scoring teams once again, while more minutes for Patrick Beverley, the acquisition of Trevor Ariza, and perhaps a chip on the shoulder of James Harden – he’s been getting an extremely bad rap for his defense – should help them defensively as well. Their bench looks to be a different story, as the loss of Jeremy Lin could hurt. Many young players will be given bigger roles and expected to perform, and with those roles will likely come some improvements and some disappointments. Luckily for Houston, though the talent isn’t too impressive off the bench, there is a certain breadth, as Francisco Garcia, Jason Terry, and new toy Kostas Papanikolaou also have the ability to command minutes. At just 25, not many people realize how young James Harden still is, as he hasn’t yet hit his basketball prime. An improvement from the already elite shooting guard could see the Rockets raise their ranking. Who will emerge as their go-to scorer off the pine? There are plenty of players young and old with the ability to command minutes off the Rockets’ bench, and if one or two can step up, Houston can prevent itself from falling too far in the standings. If Patrick Beverley and Terrence Jones can become consistent contributors for Houston on both ends of the floor and improve on last season’s campaign, the Rockets will have one of the best starting units in basketball. If they regress, Houston could easily find itself looking at the Clippers or Thunder in the first round of the playoffs. Despite a lot of bad press this offseason, the Rockets will still be one of the NBA’s best teams, though they’ll suffer from the depth and parity of their conference. 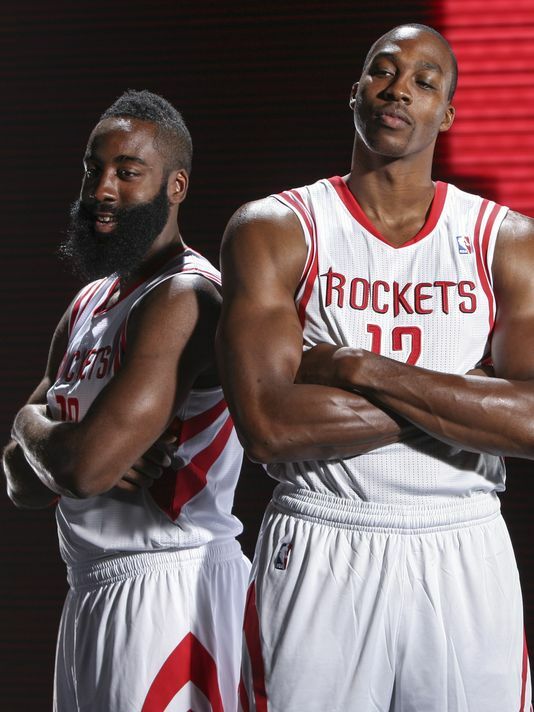 In all, two elite players and a system worth trusting should vault Houston – barely – over rivals Portland and Dallas. After shocking much of the basketball world last season, in the both the regular season and the playoffs, Portland rides their star big man, rising young point guard, and slew of excellent role players into 2014-2015 with more optimism than the Blazers have had in years. After missing the playoffs the previous year, Portland made huge strides last season thanks to a fast start and relative consistency the rest of the way. A first round playoff series for the ages raised hype ever further, before running into a brick wall in the eventual champion Spurs in the second round. Portland kept their excellent starting five intact, and added frontcourt depth with Chris Kaman. The Williams/Steve Blake switch is likely a wash, so overall, it looks like the Trail Blazers have an improved outlook this year. The Blazers have one of the best starting fives in all of basketball, surrounding their two big-time scorers with excellent defense. Matthews and Batum are demons on the wing and in transition, while Robin Lopez continues to defend the rim (1.7 BPG in 2013-2014) and rebound (8.5) his way to being one of the NBA’s most underrated big men. Just like for the Rockets, the dropoff to the bench, though, seems pretty severe. On the bright side for Portland, though, they have youth looking to improve in McCollum, Thomas Robinson, and Will Barton. At 34, Steve Blake hopes to be a contributor, but will have a lot of trouble keeping up with his matchups, especially defensively. Dorell Wright is an excellent floor spacer who doesn’t seem to have much interest in anything but. 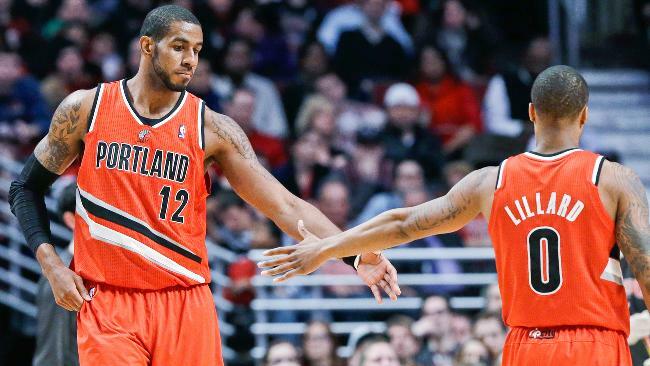 Any defensive improvement would help bolster the Blazers’ questionable second unit. Will Damian Lillard continue his growth? The young point guard has been excellent in his first couple seasons, showing ability to score from multiple spots on the court, run a smooth pick-and-roll, and hit big shots in crunch time. At 24, he still has room to grow as a player, and how far he can take his game this season will mean a lot for Portland’s prospects. The Blazers have to prove last season wasn’t a one hit wonder. 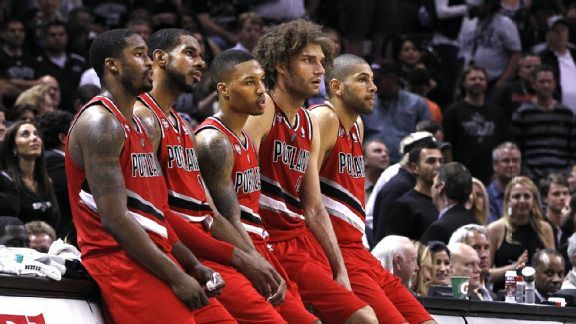 With much of the same personnel as last season, Portland won just 33 games in 2012-2013. Can this bench hold water? As discussed, the difference between the Blazers’ first and second units is stark, and coach Terry Stotts has to find a way to keep his squad in games when the starters are out. Portland has reason for optimism this season, with a developing star at the point and an elite power forward as his partner in crime. They should be a shoo-in for the playoffs and set their sights on a goal of a Rose Garden advantage in the first round of the Western playoffs. After taking the eventual champion Spurs to seven games in the playoffs, Dallas is back with a revamped roster that looks like it could be the best Mavs team since their last title. How far will they go in the deep West? Dallas was in the middle of the pack in the West last season, though it didn’t look that way in the playoffs. 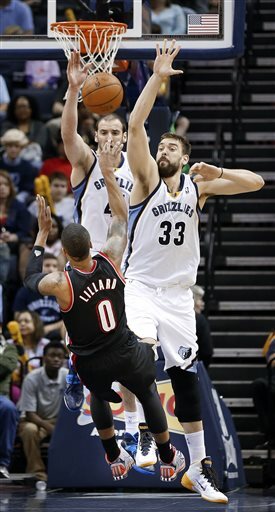 They were also a win away from the 7th seed, as they lost to Memphis the last game of the season, conceding the spot. Their roster had some glaring flaws, which they would soon address once the year was over. Who’s who? Player A is James Harden in 2011/2012, his last season as the third wheel in Oklahoma City. Player B is Chandler Parsons last season, his final as the third wheel in Houston. 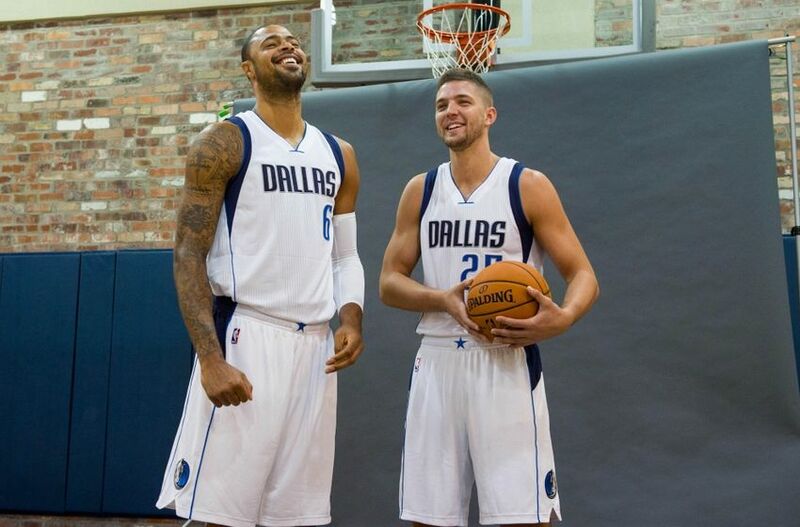 Parsons is primed to break out this year with his new team, and at 25, still has time to polish his game. Already an excellent shooter, Parsons can drive, dish, rebound, and defend the perimeter at a solid level, and a bigger role could could mean a bigger year for the wingman. Dallas took a hit at the point losing Jose Calderon, but added two solid replacements in Jameer Nelson and Raymond Felton. Combined with Devin Harris, the Mavs will have a three-headed monster of starting-caliber point guards to use at Rick Carlisle’s discretion. Vince Carter was another big contributor lost, heading to Memphis, but Dallas hopes that new faces Richard Jefferson, Rashard Lewis, and Al-Farouq Aminu will be able to pick up some of the slack from the wing off their bench. In all, an encouraging offseason for Dallas has them looking up in the West this year. Dirk, Parsons, and Monta Ellis (numberFire’s rank seems to be an outlier) should make up a solid top three, while I expect Tyson Chandler to bring up his ranks from last year’s dreadful campaign. Point guard, however, does look to be a concern in terms of ceiling, but Rick Carlisle will be able to go with the hot hand as the season progresses. What will Dallas get out of their bench? 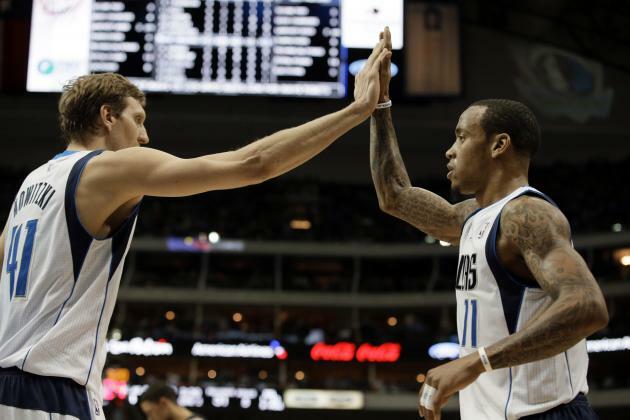 With the loss of Vince Carter, there’s no go-to scorer off the pine, and the Mavs could have trouble putting the ball in the bucket once the likes of Nowitzki and Ellis tire out. How far will Dirk regress? Nowitzki had an incredible season last year, putting himself back on the cusp of being a top ten player, even at 35 years old. 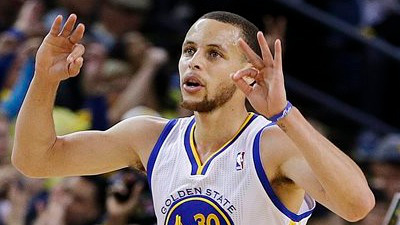 As a matter of fact, he may have also been the best shooter in the NBA, per Kirk Goldsberry of Grantland. Now 36, the all-time great will become an even greater liability defensively, and could see less of his shots hit the bottom of the bucket on the other end. 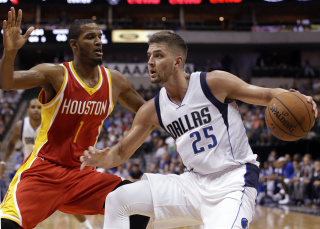 What will Chandler Parsons bring in his new uniform? If his play is consistent with last season, Dallas will be fine, but if he can make a leap as James Harden did, the Mavs could find themselves with home court in the first round. Dallas made some nice moves this offseason, and look like a better team than in 2013-2014, but questions about depth, age, and the parity of the conference will likely keep them out of the West’s elite this year. Many people are considering it a foregone conclusion that the Grizzlies’ window has closed, but a second-year coach and a team that turned a lot of heads in the playoffs last year would beg to differ. After a slow start to the season without former Defensive Player of the Year Marc Gasol, the Grizzlies finished the season 33-13 with him back in the lineup, good for the third-best record in the NBA. Not many people took note of Memphis, but they showed what they were made of in the first round of the playoffs, pushing Kevin Durant’s Thunder to the brink of elimination for the second straight season (the Grizzlies defeated the Thunder in the second round in 2013) before falling in seven games. The Grizzlies had a rather uneventful offseason in terms of personnel changes, but the addition of Vince Carter is an upgrade over sharpshooter Mike Miller, who fled to Cleveland to join buddy LeBron James. 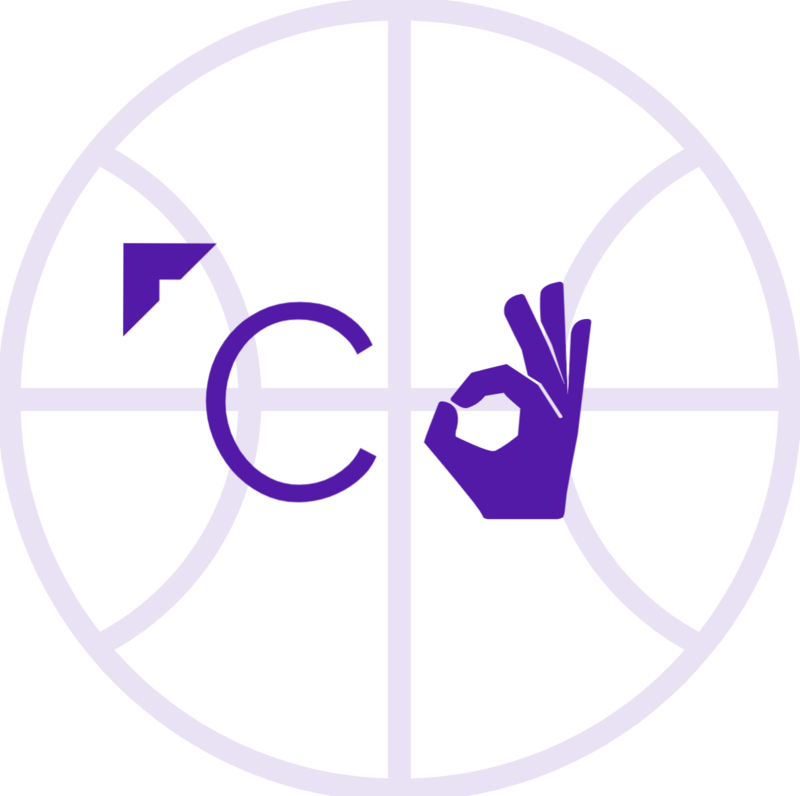 Carter has reinvented his game in the late stages of his career, and can provide offense from multiple spots on the floor alongside his surprisingly competent defense. Memphis will come back with the same core as last season in hopes of improvement. Mike Conley is one of the league’s most underrated point guards: he’s fast, quick, can shoot, and is elite defensively. The duo of Conley and Gasol provides value on both sides of the ball, while secondary contributors like Zach Randolph and Tony Allen specialize in one or the other. Vince Carter looks to be a big addition, as the Grizzlies now have plenty of depth on the wing, as either Courtney Lee, Tayshaun Prince, or both, could start their fair share of games. Additionaly, Kosta Koufos continues to show he deserves minutes at the NBA level, as the big man is just the rebounder/defender to spell Marc Gasol while he’s off the court. The 25-year old center averaged 14 points, 11 rebounds, and 2 blocks per 36 minutes last season, which sounds like an average or better starting center when extrapolated. Backup point guards Beno Udrih and Nick Calathes figure to contribute to the cause as well for Memphis’ solid-looking lineup. Will Memphis make a trade? With Zach Randolph aging and Marc Gasol an impending free agent, the Grizzlies’ contention window seems to be on its way shut. Adding another impact player to the fold would help Memphis’ prospects of not only contending this season, but keeping Gasol next. Can Courtney Lee continue to contribute at a relatively high level? Before his acquisition by the Grizzlies last season, Lee was all but forgotten as a relevant NBA swingman, but played well enough last year to start in the playoffs. If Lee can stay consistent, it will mean great things for this team’s depth at shooting guard. 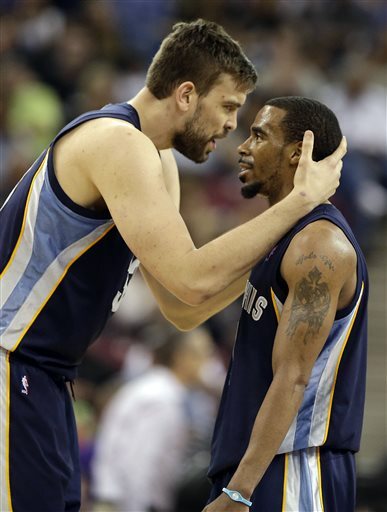 Can the Grizzlies keep up with the competition? Right on the cusp of the playoffs, teams like the Suns, Pelicans, and Nuggets, who would likely be playoff locks in the East, will be breathing down the back of Memphis’ neck. Just as it did last year, the rush for the playoffs may come down to the final game of the season. Despite the sheer number of talented teams ahead of Memphis on this rank, consistent defense and top-flight talent at both the one and five should be enough to help the Grizzlies sneak into the playoff race once again. The Suns are the best team not projected to make the playoffs, but could easily jump right into the thick of things if a few things bounce the right way. New acquisition Isaiah Thomas, one of the league’s best unheralded point guards, will join what now might be the best backcourt in the NBA. The Suns will run up and down the court and score bushels of points with elite guard play and good-enough forwards like Gerald Green and Markieff Morris. Their two biggest questions are the development of Alex Len – will it happen? – and how badly they’ll miss advanced stats darling Channing Frye, whose ability to stretch the floor on offense and play competent D was a big part of the Suns’ cinderella run last season. Denver had a down year last season after losing Andre Iguodala and suffering injury problems, but will have a chance to sneak into the playoffs this season with the return of Arron Afflalo and the further development of young studs like Ty Lawson and Kenneth Faried. The supporting cast is deep, with Timofey Mozgov rounding into form and Nate Robinson and Wilson Chandler providing points off the bench. If they want to make the postseason, however, they’ll need solid contributions from enigmatic players like Danilo Gallinari, JaVale McGee, and J.J. Hickson. Anthony Davis is showing us all why he was the number one pick in his draft, but the future MVP candidate probably won’t see the playoffs this season, as a roster full of players that fill similar roles (Jrue Holiday, Tyreke Evans, and Eric Gordon are all best with the ball in their hands) will likely hurt the Pelicans for the second consecutive season if a trade isn’t made. The addition of Omer Asik will bring further toughness to the Pelicans front line, but lack of depth on the bench, among other things, will separate the Pelicans from the other Western Conference playoff squads. The Kings continue to befuddle – are they trying to win now, or building for the future? With Rudy Gay and DeMarcus Cousins in tow, they have some premium talent, but the loss of Isaiah Thomas, easily their second-best player last season, will continue to hold the Kings back. Darren Collison isn’t too shabby a replacement, but he has big shoes (figuratively, of course – Thomas is just 5′ 9″) to fill. Unfortunately for returning Kobe Bryant, the Lakers don’t look like a playoff team this season. They could be fun to watch, however, with a Steve Nash/Jeremy Lin combination at the point and the ever-charismatic Nick Young on the wing. Carlos Boozer will try (but fail) to fill the shoes of the departed Pau Gasol as a lame duck placeholding for the youngster Julius Randle. In all, the Lakers have some interesting pieces, but won’t sniff contention until they either make a blockbuster trade or add a marquee free agent or two next offseason. Now that Kevin Love is gone, the Wolves can focus on their rebuilding project with Andrew Wiggins as its cornerstone. Despite his shooting woes, the rest of Ricky Rubio’s game is elite, as his influence of the game on both ends of the court will be Minnesota’s greatest asset this season. Big man Nikola Pekovic will continue to fly under the radar, while teammates like Wiggins and Zach LaVine will fly in other ways. Wolves fans shouldn’t expect a playoff berth, but could have some fun basketball to watch as plenty of young talent just begins to gel. Despite having a player that can beat LeBron one on one, the Jazz will tank once again this season, as they simply don’t have enough talent at any position to keep up in the West. Eyes will be on rookie Dante Exum’s debut, Trey Burke’s and Derrick Favors’ development (are they the future? ), and, of course, Steve Novak’s immortal jump shot. Okay, maybe not so much the last one, but you get the idea. The Jazz will look to build chemistry among their young players just before they likely add another early in next year’s draft. Eastern Conference preview can be found here. *numberFire took down their 2013-2014 rankings before this article was completed. Previous postWho has the Best Backcourt in the NBA? Next postCan Sanchez Keep the Eagles Flying? Enjoyed the read…decided to follow…lol!! Now consider myself a more informed SanAntonio fan!